security experts that bundle various solutions for specific needs. to your unique security needs. Imagine the comfort level of knowing who is at the door from anywhere in the world? Imagine knowing that your children can ward off annoying door knockers that may be up to no good. 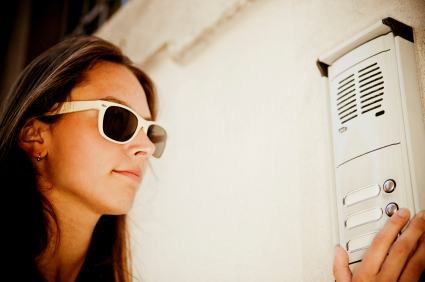 Never ever open the door to a stranger, instead let them know that you are home by answering your door with one of our intercom solutions. Installing a security system is only part of the answer to the safety of your family. Securing homes is imprative these days. Your Family wants to feel safe in their own home and something they can use that is second nature to answering the door. As your security needs are very peronsal we carry various intercom solutions all designed to provide different levels of security. Don't settle for a door bell when you need a integrated security solution. A high tech security system bundled with high security locks provide no protection for your home and family if it is off and unlocked. Our intercom solutions will provide your family with the ability to speak and see who is at the door away from the door. Our Intercom security is now paramount in providing your family with full circle protection. We personally believe that every intruder will always ring the door bell before an intrusion is started. Always answer the door, but do it with a intercom. Pre-Lock Security Services is authorized to sell, install & service Aiphone & Logenitc products. Let our security experts show you how easy you can feel secure when someone comes knocking.